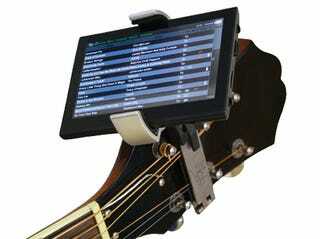 Music and technology aren't unfamiliar bedfellows, but the i-Tab offers a unique method for enhancing your guitar with gadgetry: clamp it on. Like a TomTom for tunes, the electronic songbook prompts players with chords and lyrics for thousands of songs. For hundreds of years guitarists have mastered their instrument with patience and practice. But this is 2010—who has time to practice? The i-Tab accelerates the learning process by offering thousands of dynamic tabs, scrolling chords at any tempo while you stumble your way through the song. The device has a 5" touch screen—using your guitar pick as stylus is encouraged—and 4GB of memory to hold the songs, which can be downloaded through a tab store. The company claims there will be 5000 tunes available at launch. On some songs you can accompany your noodling with backing tracks that can be played over speakers or headphones. And you'll probably need them—having the i-Tab clamped to your guitar isn't likely to win you many bandmates. Sure it'll fast-track your fingerpicking, but at what price.